Not easy finding an intertitle in Anthony Mann’s oeuvre. Lots of opening titles thanking the people of New Mexico etc, and lots declaring the factual nature of the story we are about to see — although Mann seems to have preferred VO for such direct announcement. But this card, from MEN IN WAR (1957), just about satisfies my stringent requirements, even if it’s only “inter” the main titles and the film. It does neatly tie the story, an Korean war existentialist crisis drama, into the historical record, connecting it to other Philip Yordan scripts filmed by Mann — EL CID and THE FALL OF THE ROMAN EMPIRE and THE LAST FRONTIER and THE MAN FROM LARAMIE. Yordan seems to embrace both the mythic and universal properties of the western and other period subjects, and the more specific, historically-rooted possibilities. I’m a little wary of generalizing about Yordan as an artist though, since he fronted for so many blacklisted writers (taking a healthy cut of their fees). When it cam time to restore the names of the true authors to the films’ credits, Yordan had apparently fallen out with some of his “collaborators” and refused to confirm their involvement. This strikes me as rather improper. And since Yordan was working as producer on the Bronston epics his name is attached to as writer, I have some concerns as to whether he actually did any writing. Bernard Gordon’s memoir, Hollywood Exile, makes no mention of Yordan doing any real writing on 55 DAYS AT PEKING (great stuff about Nick Ray though). — EXCEPT — a viewing of THE MAN FROM LARAMIE shows so many thematic concerns and character scenarios in common with TFOTRE that it becomes inconceivable that Yordan wasn’t a prime mover on that script. In a weird way, Yordan’s name is still quite a good badge of quality on a film’s credits though, since he chose to work with talented blacklistees whose approach was sympatico to his own. So there’s a kind of pseudo-authorial style detectable anyhow. 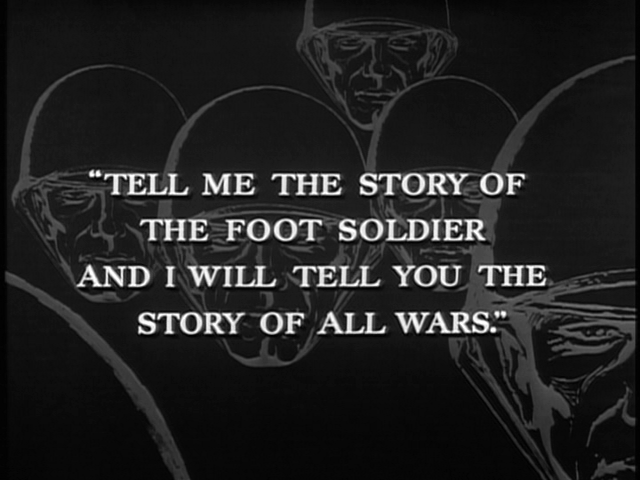 As both the uber-generic title and the intertitle suggest, MEN IN WAR is a microcosm of the whole history of armed conflict. At times it almost feels like this dwindling platoon are on their way back to caveman times. Characterisation is briskly confined to what we can see and hear of the men’s behaviour — large numbers of them are left largely blank, with only Robert Ryan, Aldo Ray, Victor Mature, James Edwards (above) and Robert Keith making strong impressions: but those impressions are VERY strong. But I can never work out which one is Anthony Ray, and the normally distinctive LQ Jones is hard to recognise. The conflict between Robert and Aldo is very interesting because it flies in the face of traditional war movie dynamics. Not just because Ray is looking out for himself and his Colonel, having counted himself out of the war. In most war films, there’s a character who’s right and a character who’s wrong. In this movie, Ray is consistently right, in the sense of acting in a way that ensures his survival. But it’s far from certain that Ryan is wrong. Most of the time he’s an effective officer, though given to self-doubt. Many of the personal clashes arise from the fact that he’s intent on contributing to the war, and Ray just wants to get out of it alive (I’m on Ray’s side). On a first viewing, the ending, where Ryan reads out the names of his fallen men so Ray can award them posthumous silver stars, seemed like the movie was backing into more conventional patriotic territory. But the fact that Ray is tossing the medals into the dust rather disproves me. Each man is being true to the character he’s shown throughout the story. Only the tiresome song on the soundtrack attempts uplift (Mann seems PLAGUED by rancid balladry — GOD’S LITTLE ACRE has one of the more listenable ones, which isn’t saying much, but THE LAST FRONTIER and THE MAN FROM LARAMIE’s title tracks could be used in aversion therapy to put people off fifties movies for life). 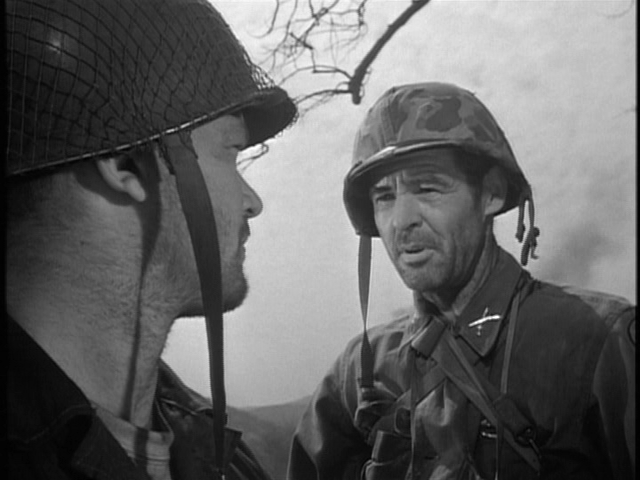 MEN IN WAR is a really great work, I think, in a genre I have no naturally sympathy for (supposedly Robert Ryan, a former soldier himself, shared my contempt for the glamorizing of armed conflict — but I suspect he dug this movie). As with all Mann’s best movies, the tactile/visceral strengths are inseparable from what might seem to be the contrasting quality of thoughtfulness. END of Anthony Mann Week. Tomorrow: something else! Tuesday: The Shadowplay August Impossible Film Quiz. This entry was posted on August 15, 2010 at 9:33 pm and is filed under FILM, Politics with tags Aldo Ray, Anthony Mann, Anthony Mann Week, Bernard Gordon, Hollywood Exile, James Edwards, Men in War, Philip Yordan, Robert Ryan, The Man From Laramie. You can follow any responses to this entry through the RSS 2.0 feed. You can leave a response, or trackback from your own site. As I’ve heard suggested, a good short to show before this is DUCK AMUCK – in both films, the threat IS the film. This idea is rarely exploited, but when great directors try, there are memorable results. Suzuki and Lang both killed with treacherous geometry (as a character gets his foot caught in an acute angle, intersecting train tracks, in TAKE AIM AT THE POLICE VAN), as does Nick Ray in PARTY GIRL, where Lee J. Cobb’s heavy is done in by a vertical line (a hitherto invisible stanchion) that causes him to splash acid into his own face by accident. Anyway, sad that Mann week is over! Glad you were never unManned by the task. This piece is really good, and your page for REIGN OF TERROR eats my review for breakfast! Thanks, and you’re too modest! Sherlock Jnr has my favourite “hostile film attack” sequence. One might also cite the original The Ladykillers, a film of expressionist angles, in which a railway signal changes with fatal results. I’m vaguely thinking of showing Men in War to my students this year. I saw Men in War recently, and I agree it is an extraordinary war movie. I went into it on the strength of Mann’s name alone, but secretly feared it would be a typical bore full of deadly (permit the pun) cliches. I was more than pleasantly surprised to find such an interesting film. It was disappointing to see that Leonard Maltin’s guide was basically blasé about it. Thanks for this thoughtful review. MEN IN WAR is amazingly modern and every composition is breath-taking. It’s a very tough film that is beyond anti-war in a way. I have no doubt that these surviving veterans will dissemble after returning to the homefront on account of well-earned shellshock. But my favourite war film of the 50s is The Steel Helmet since it kind of escapes what Fuller, the single greatest critic of the war film genre, believed was a weakness of these movies like the fact that Robert Ryan’s platoon leader has time to go doe-eyed over pictures of his wife and brief attempts at humanism when he looks at a Korean soldier’s wife’s picture in his wallet. Fuller totally goes beyond that, save maybe for the relationship between the boy and Gene Evans(but then that’s handled very well). The photos in Men in War — something I was quite willing to forgive. They serve as a complicating factor to the film’s presentation of the casual racism the men display towards “gooks”. The enemy is presented as almost supernatural, much like the Indians in a traditional western, until we get to see a prisoner up close. It’s interesting that the Korean War movies are so questioning, since the war didn’t invite the large-scale public opposition associated with Viet Nam. Thanks, Flav. Maltin is certainly preferable to Britain’s Halliwell, but he’s not always exactly illuminating. Still, nobody’s perfect, as Joe E Brown is always saying. James Edwards should have been the first black film star — but he wasn’t. I think he had an edge that Poitier lacked and thus upset white moviegoers and studio chiefs. I can imagine that. 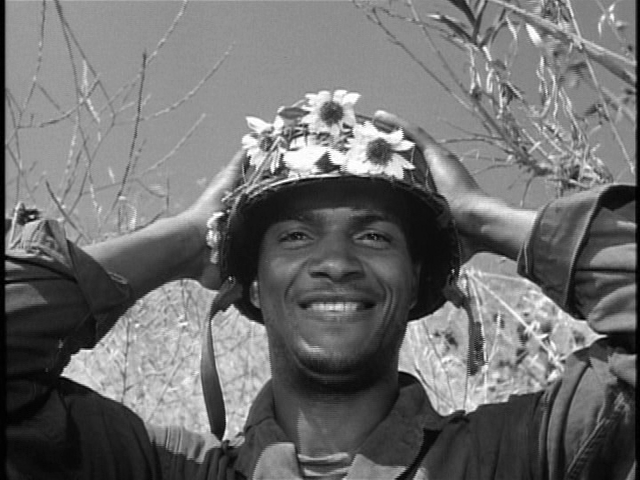 Not to be unkind to Poitier, who was and is great, but I guess he represented the acceptable face of black masculinity. That was it precisely. Lead us not forget that when the Supreme Court decided “Loving vs. Virginia” in 1967 the American public was more opposed to interracial marriage than they are yto gay marriage today. Yet Sidney Poitier was the number one box office star. A few years afterwards he took full advantage of “Loving” by marrying the lovely Joanna Shumkus (a Jean-Luc Godard discovery.) They’re STILL married. Ahh…Jean-Luc Godard, cinema’s secret cupid!!! David E. Didn’t James Edwards’s opposition to the blacklist cost him his career as a potential star and relegated him to minor roles (which he did well)? I seem to remember that he refused to condemn Paul Robeson in the early 50s and this went against him. If you have any further information on this subject, we’d all be grateful. I’ve never heard anything along those lines about Edwards. Another great African-American actor, Canada Lee, certainly suffered at the hands of the blacklisters. Yes, he did and that is documented. I really should write certain things down after reading them since one never knows when an issue may appear in future. I guess I’m a little late here, but I always loved this film and watched it again fairly recently. It’s a very unique film in the way it concentrates its perspective on the troop. The characterizations are kept pretty thin, which is fine, but I can’t think of any other Mann film where this is the case. Still, his ideas of manliness and heroism fit right in. I love the old General being driven around in the jeep, and that character who drives him (I can’t remember anyone’s names). It does feel dated at times, especially with the portrayal of shell shock, but that is inevitable when you go from this to Apocalypse Now to Saving Private Ryan. Spielberg must have watched this film many times, almost as much as he watched Stalingrad, when he made Private Ryan. I remembered the enemy being even more vague than when I saw it recently. As you say, there is definitely the feel of a western and several references to westerns (as there is in all US war movies). This film is best when you don’t know who anyone is, why they are there, and they keep getting attacked. It’s a great, simple set up. They should remake this film every ten years and put in the war du jour. This feels MUCH more real to me than Private Ryan, which has great battles and a visceral feel but also tons of soap opera dramatics which are brushed aside more efficiently here. One can see why Tarantino named a character in Inglourious Basterds after Aldo Ray, but he’s quite incapable of doing what Mann does here, in terms of understated characterisation and tenderness.